Everyone mark you calendars for the Bluebonnets & Buckles Online Sale being put on by the Texas Maine Anjou Association, and hosted by Steerplanet.com. The sale is being held in conjunction with the Texas State Maine and Chi Preview Show in Ft. Worth. 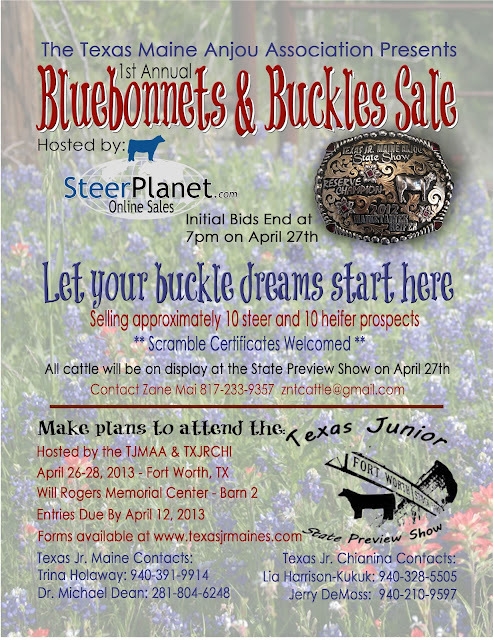 Sale will end at 7pm on April 27th, and all calves will be available that day for viewing at the show grounds. Prior to the sale, cattle can be previewed at the consignors' farms. Stay tuned over the next 2 months for updates on the consignors and their cattle! This will be a fun filled weekend in Cowtown, so make sure to not miss the entry deadline of April 12th to get your calves entered into the show.